The effective use of mobile computing devices - whether it be for simple goods-in recording or for queue busting , can not only increase productivity dramatically but also customer satisfaction. These are some of the most popular we supply. 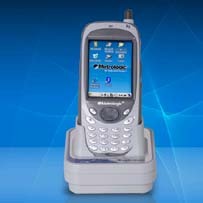 The Metrologic Optimus SP5700 PDA is a durable Windows based terminal, ideal for applications throughout the supply chain in retail, and hospitality applications. With a durability rating of IP54 and a 1.5m drop specification, the Optimus PDA brings versatility to the harshest of indoor and outdoor workplace environments, being designed specifically for applications where temperature varies according to the season and working conditions can be relatively poor. Display 3.5" TFT 64K, Colour LCD with Touch screen. It is designed to provide high performance all day, everyday. With its integrated laser/LRCCD barcode scanning unit, the ScanPal 2 is ideal for inventory control, inin retail, and hospitality applications. Display 128 x 64 graphic dots FSTN with LED backlit. Communications RS-232 - Transmission speed up to 115.2k bps. lrDA - Standard 1.0 compatible, up to 115.2k bps. High speed IR - Up to 115.2k bps transmission rate. Laser Scanner Light source - Visible Laser diode operating at 670 ± 15nm. Scan rate - 36 ± scans/sec Scan angle - 42° nominal. Depth of field - 5cm - 95cm, depends on bar code resolution. Battery Main - Two AAA size removable/rechargeable batteries, Backup - 3.0V, 7.0mAh, rechargeable NiMH battery. Accessories KBW cable, High speed IR Transceiver, Protective case, Dual battery pack charger, Download/ Charger Cradle. 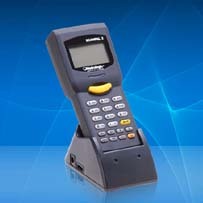 TheMetrologics Optimus S portable data terminal is a compact batch portable data terminal designed for retail and light warehouse data collection applications, including inventory and stocking. 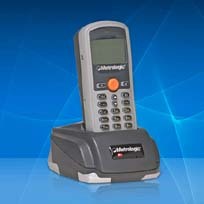 The stylish Optimus S enables users to quickly scan and store product information, then load into its cradle and send the data back to the host to up date information. Display LCD- 100 x 64 pixels, back lit. Keypad 21 rubber keys; alpha/numeric, function, scanner. Processor 16 bit CMOS, Low power consumption. Cradle Comms IrDA or Cradle IR. Barcode Options Laser Scan Engine, 100 scan lines per second Width of Scan 290 mm(11.4") @ 222mm (8.75"). Depth of scan 20mm-222mm (.75"- 8.75") for 0.33mm (13mil) barcodes. Battery Li-ion 3.7V, 7.0mQ hours, rechargeable lithium battery over 100 hours.